Barco will debut a host of new features across its product lines, and will also feature new products at the show. 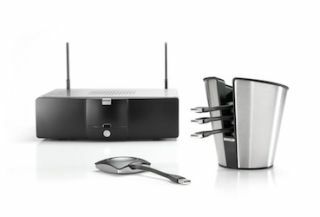 • Barco’s ClickShare "one-click" wireless meeting room presentation system improves collaboration to enhance productivity and decision-making in today's companies. Now enhanced with dual-display and audio functionality, Windows 8 compatibility, as well as iPad connectivity (with free app and software update), ClickShare is more user friendly than ever to facilitate the BYOD trend. • Featuring high image quality thanks to optimum brightness, contrast and viewing angle, the OverView MVD-5521 55-inch near-seamless LCD video wall has an ultra-narrow bezel, making it ideal for tiled video walls. Innovative In-Plane Switching technology ensures accurate colors and stable response time with no blackening, while Direct LED provides superior black levels. • Slim, ultra-bright, and typhoon-tested, the 8.33 mm pixel pitch C8 Outdoor LED Display offers Barco's hallmark DX image processing and Director Toolset for consistent, high performance. At 5,000 nits brightness, this versatile LED provides high-quality scaling, auto redundancy and 16-bit processing/color. Common mechanical features among the C-Series make it ideal for cross-rental applications.